Shop for the items you want. Put your selections in the Shopping cart. 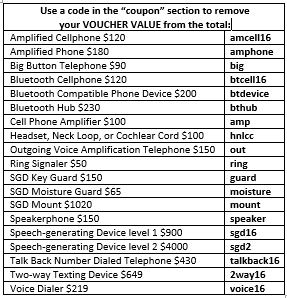 Use the “coupon code” that tells me what voucher type you have, and the total cost will adjust. Checkout to submit your payment for shipping and any cost over the voucher value(s). Upload the voucher when you place your order. Mail your voucher to TxACD, 1907 Lavaca St Friendswood, TX 77546. Once we receive your voucher, we will package your device and ship it to you by USPS Priority Mail with Signature Required for delivery. THE PERSON LISTED ON THE VOUCHER WILL HAVE TO SIGN TO RECEIVE THE PACKAGE. After placing your order, you can pick a date to meet for delivery on our appt calendar.